So here we are, Merry Christmas! Can’t believe how fast December has gone, actually can’t believe how fast the year has gone. It’s the last day of 12 Days and I couldn’t think of a better way to end it than to share with you all how to have the perfect Christmas. And when I say perfect, I really mean imperfect because I believe perfection lies in the imperfections of everyday. I’ve put together all my recipes, tips and tricks to having the most magical day ever. You know that quote, “I’m only a morning person on Christmas”, well that could not be more accurate. Ever since my sister and I were tiny humans, we would run into each others rooms early on Christmas morning and then run downstairs to see what Santa had left us in our stockings. Our excitement would eventually wake our parents and grandparents up and we would sit around the living room by the tree opening our stockings. After that, we all head into the kitchen to make our Christmas breakfast, pancakes, fruit, hot chocolate and egg nog. 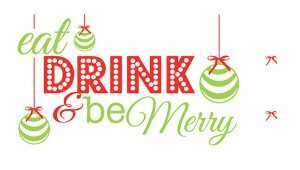 Once the dishes have been cleared and washed, we’ll go back to the tree and open all of our presents while sipping on more egg nog and listening to Christmas music. It’s always the most chill, relaxed but exciting morning of the year. Each family always has their own Christmas traditions, and I think that carrying those for generations hold so much meaning. But I also think that coming up with new traditions to pass on to your kids and grandkids are so special. Every year for Christmas my grandma made her special ‘holiday nugget’ cookies (our family recipe), and as I got older I began to carry on that tradition as well. My family has all the little things we do on Christmas that we’ve pretty much done my whole life, and carrying on those traditions no matter where we are always makes the day extra special. Traditions are rooted in family, remember to be thankful to have been blessed with your family, Christmas is rooted in family. Lounge around all day in your Christmas PJs or ugly Christmas sweaters… you deserve it! One thing my family has started doing over the past few years is different kinds of tapas during festive meals. Tapas is the Spanish word for small plate/appetizer. Usually, we do these on slices of baguette or simply on crackers. Our go-to is a thin slice of baguette, garlic yoghurt, caramelized onions, grilled red peppers, prosciutto, a slice of camembert with sugar and bruleed with a blow torch (absolutely to die for). Others we have done are a slice of chorizo with asparagus and aioli, crab salad with avocado and caviar, as well as prosciutto, blue cheese, pear, honey and black pepper. These are so easy to make ahead of time and in bulk and are always the first to go at any dinner or gathering. Carefully split the prawns in half, you can leave the head on or you can remove it and use it to make a prawn head oil. Season with salt, pepper and any other desired herbs. In a large pan, heat butter and garlic on high heat until butter bubbles. Put prawns in the hot pan (meat side down). Cook 2 minutes, flip, and cook another two minutes. Serve hot with fresh parsley to garnish. Roasts are always the perfect center piece for a festive meal. Whether it’s turkey, chicken, pork belly or ribs, theres always a way to make it a little more Christmassy. Try spices like clove, all-spice, ginger, star anise, nutmeg and cinnamon as your dry rub. If you have access to it, using fresh spices (like whole cinnamon sticks) can do wonders. Adding a little bit of sweetness using oranges or cranberries is another way to amp up your roast. One of the desserts I made this year was a tiramisu. I always thought that it was a technical and difficult dessert to make, but it couldn’t be easier. This boozy, creamy dessert will be a hit! Start by whipping the cream with the powdered sugar and a dash of vanilla essence. Once soft peaks are formed, fold in the marscapone. Set aside. Mix coffee and Kahlua in a shallow tin. If you’re using pound cake, cut into strips the size of your container. To assemble: Start with a thin layer of the cream at the bottom of a clear class container. Dip your cake or lady fingers in the coffee mixture and form one layer. Add cream on top and spread evenly. Repeat this process until you’re done. Refrigerate for a few hours or over night. Before serving, dust with cocoa powder. To make the shells of the canoli, bring the brown sugar, butter and syrup to boil in a pan (until it becomes a silky caramel). Pour the caramel into a mixture of flour and baking soda. Mix until well combined. Add brandy and mix it in. Scoop spoon full of the mixture onto a baking sheet (with lot’s of space in between) and bake at 375 degrees for 7 1/2 minutes. Once baked, leaved to cool for exactly 90 seconds, then shape around a wooden spoon or rolling pin until set. Set the shells aside until ready to fill and eat. For the filling, whip the cream until soft peaks form. Then add marscapone and gently fold in. Add chopped chocolate, cranberries and nuts to the mixture and grate in half of the orange zest. Gently mixed. Right before eating, put the filling in a piping bag and fill the shells. Serve topped with powdered sugar and orange zest. And with that I’m signing off for 2018. Thank you for an amazing year, can’t wait to see all the next has to offer. Happy Saturday lovelies!! I’m sitting here writing this from Tokyo, back with my family to celebrate the holidays. Since I’m now back home, I tried making a new Christmassy cocktail last night that I’ve been dying to try for a while. So for day 8 I thought I’d share the recipe with you all. I’ll link the recipe I used for inspo down below as well. Mix all ingredients well in a large punch bowl or pitcher with lots of large ice cubes. Add extra coconut water or lime juice if it’s too strong. Right before serving, add some sprigs of mint leaves. 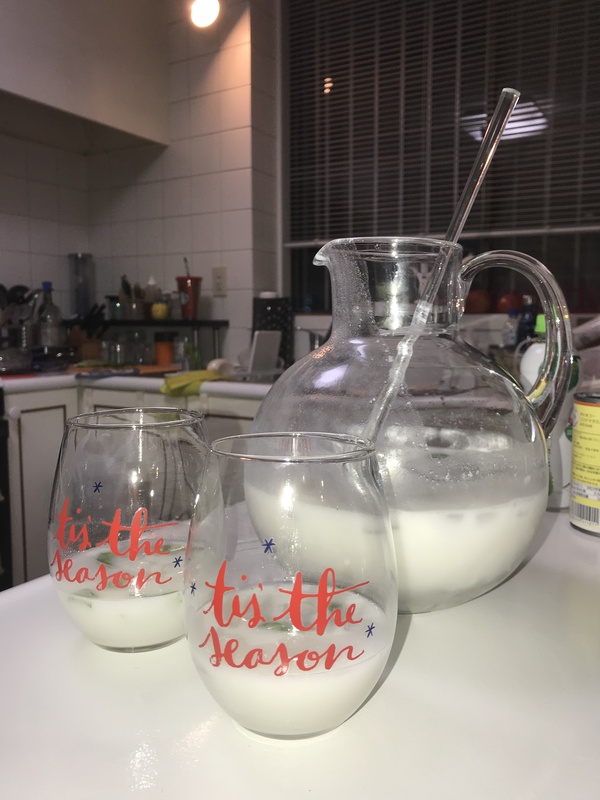 Serve chilled with adorable Christmas glasses (the one’s in the photo are from Target). We’re almost there! If you are anything like me, the food during Christmas is one of the best part about celebrating. Whether you have your big meal on Christmas Eve or on Christmas Day, here is the guide to planning the ultimate Christmas dinner.